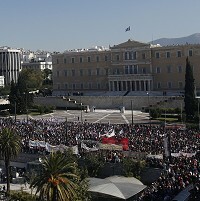 A 48-hour general strike by Greek workers seeking to block their government's new austerity measures has brought the troubled nation to a standstill, causing travel disruptions to British holidaymakers visiting the country. Incidents like this highlight the importance of taking out a comprehensive travel insurance policy. The industrial action saw thousands of angry protesters, including doctors, dentists, lawyers, teachers and dock workers, taking to the streets. A number of flights were cancelled or delayed as air traffic controllers staged a 12-hour strike. Greek MPs are voting on Thursday over the new austerity measures, which include plans for further cuts to pensions and salaries, as well as tax hikes.